Melbourne is a city in Brevard County, Florida, United States. 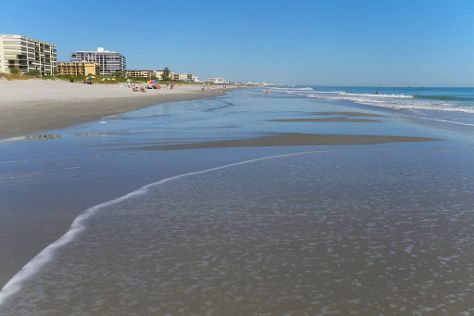 You'll enjoy a bit of beach vacationing at Cocoa Beach and Lighthouse Point Park. Attractions like Legoland Florida Resort and Dunlawton Sugar Mill Gardens make great kid-friendly stops. Venture out of the city with trips to Cocoa Beach (Cocoa Beach Pier & Ron Jon Surf Shop), Fishing Charters & Tours (in Port Canaveral) and NASA Kennedy Space Center Visitor Complex (in Titusville). There's still lots to do: stroll through Brevard Zoo, engage your brain at Marine Science Center, enjoy the sand and surf at Indialantic Boardwalk and Seashore, and explore the galleries of Ponce de Leon Inlet Lighthouse & Museum. Expect a daytime high around 89°F in June, and nighttime lows around 74°F. Finish your sightseeing early on the 29th (Sat) so you can travel back home.